« New Egadz album, or not?! This was my first electronic project, ever. I´m able to do the some of the electrics in my house, but this was the first time that I worked with ICs and this really small stuff. 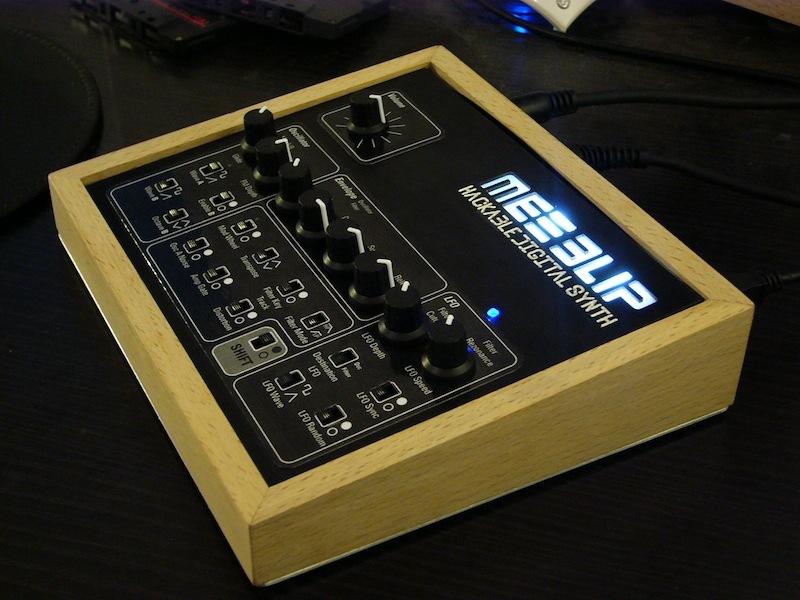 The instructions on the meeblip page are very useful and it took me about 2,5 hours to complete the kit. I have to say I was rather surprised when I hooked it up to my sound system and was able to hear some sound. It was working. I did not expected to be that easy. Because I bought the diy kit, it comes without any case. I wanted to build one myself. This was in comparison to the MeeBlip kit, rather complicated. I build the housing mainly out of wood and plastics. The basic shape and design was quickly done. I milled the front panel on my CNC router and everything went well together quite quickly. But I was not happy with the installation of the out and input jacks. There was a rather big cable chaos inside the case. I decided to make a small circuit board on my own to get rid of the cable-chaos. But this was much more complicated then expected. First I tried to design it with Eagle Cad, a free design program for circuit boards. But I had no success with this. So I draw it on my own. Took almost a day. But it worked in the end, was a very rewarding experience and, most important, I learned something new. So now I´m playing with my new, own build synth. Because this thing is hackable and completely documented, I hope there will be some nice modifications in the near future. Dieser Beitrag wurde vor am Mittwoch, 5. Januar 2011 um 11:47 Uhr veröffentlicht und unter DIY, Music gespeichert. Sie können Kommentare zu diesem Eintrag über den RSS-2.0-Feed verfolgen. Sie können einen Kommentar hinterlassen, Pingbacks/Trackbacks sind momentan deaktiviert.